Synthetic peptide corresponding to Human NLRC4 (C terminal). 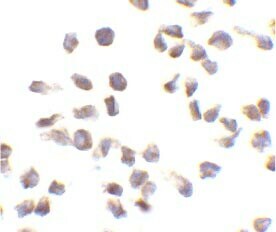 Human peripheral blood leukocyte cell lysate. Our Abpromise guarantee covers the use of ab21301 in the following tested applications. WB Use a concentration of 0.5 - 2 µg/ml. Detects a band of approximately 110 kDa (predicted molecular weight: 116 kDa). Plays a role in the promotion of apoptosis. Isoform 2 is expressed ubiquitously, although highly expressed in lung and spleen. Isoform 1 is highly expressed in lung, followed by leukocytes especially monocytes, lymph node, colon, brain, prostate, placenta, spleen, bone marrow and fetal liver. Isoform 4 is only detected in brain. ab21301 has not yet been referenced specifically in any publications. Publishing research using ab21301? Please let us know so that we can cite the reference in this datasheet. There are currently no Customer reviews or Questions for ab21301.